Rolls is a dish of Japanese and Korean cuisine, consisting of rice, extruded twisted in seaweed, with the addition of various toppings. Served with mini rolls with sauce. 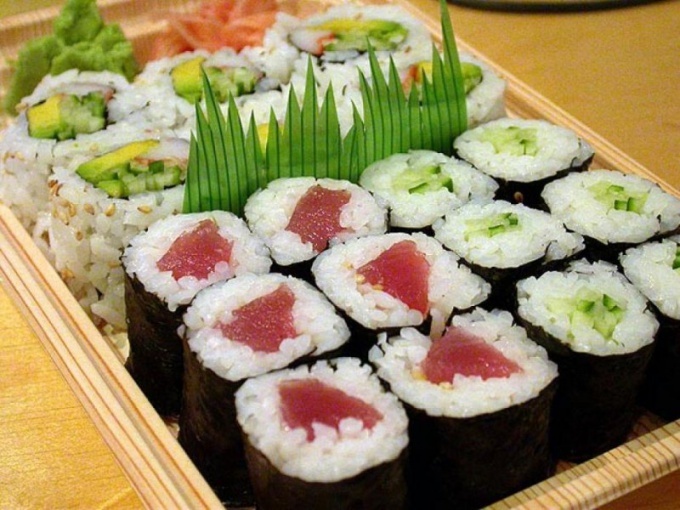 The most favorite among Russian citizens are California rolls, which are integral components of cheese, avocado and crab meat, on top they sprinkle fish caviar "Tobiko". Often they are stuffed with salmon, tuna, cucumber and shrimp. The second step in popularity is the "Philadelphia", inside out rice rolls. The role of the toppings they use cream cheese with caviar, cucumber and green onions. Outside they wrapped salted salmon. Third place is "Unagi," little nori-wrapped rolls, dressed with smoked eel. Despite the apparent complexity of the preparation, it is not necessary to be a professional Japanese sushi chef to prepare that exotic dish your own. Avocado, crab sticks, smoked fish, cheese, fresh vegetables, stuffing for spring rolls at home can be very different, it all depends on the imagination. You can try to combine with each other diverse products, adding ketchup, mayonnaise, sour cream or other sauces. Very tasty and unusual rolls out seafood, such as mussels and shrimp. The simplest stuffing at home can be an omelet with smoked chicken. For children cook sweet rolls with cheese, cheese and fruits. Moreover, the rolls can be vegetarian, consisting of vegetables, mushrooms and herbs. - 2 tbsp of mayonnaise. Cucumbers and crab sticks cut into thin narrow strips, cheese cut into small pieces, then add mayonnaise, eggs and all mixed. On nori decomposed boiled rice, and it finished filling. After that, the sheet is carefully rolled out, collapses in the sesame seeds and cut into pieces a La carte. Serves rolls with soy sauce. Beef with onions stew until soft. Separately beat eggs, add to the meat. 10 minutes all is fried, then added herbs, pepper and salt. To the cooled filling add grated cheese. On pita bread decomposed the filling evenly and rolled into a sausage. Then all the wrapped rolls stacked on a baking sheet, baked for 10 minutes. This filling makes a delicious and nutritious. - 400 g salted salmon or salmon. All the ingredients are cut into thin strips. Avocado not darkened, sbrazhivaetsya lemon juice. On a sheet of nori is spread a layer of cooked rice, then flipped and coated with cream cheese. Cheese is evenly distributed fish and vegetable weight and minimizes roll-up. Such inside-out rolls are just as tasty as usual.